Air Force School Jalahalli East Bangalore observed Vigilance Awareness week 2017 from 30th Oct 17 to 04th Nov 17. 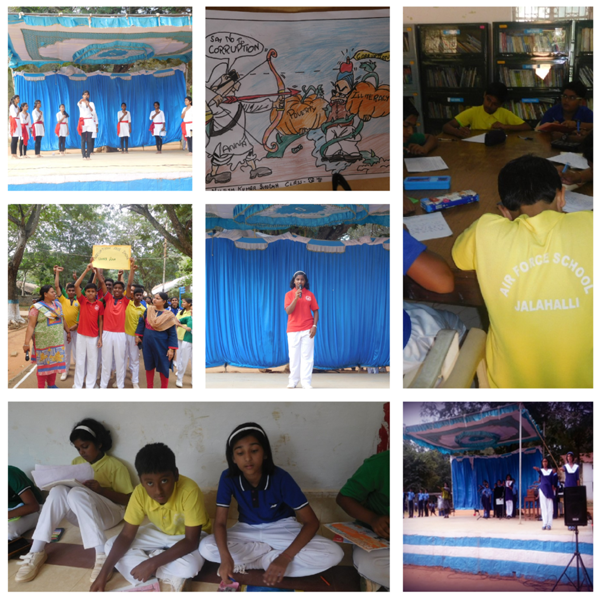 During the week the following Programmes were organized by teachers and students. 1. Special assembly was conducted on 30th Oct in which Students , Teachers and other staff of Air Force school organized a pledge Ceremony. Miss Vibha of class IX A read the pledge in the assembly also took the pledge. It was followed by integrity pledge. Miss Nandini gave the pledge in English and Miss Jagriti in Hindi.It could instill integrity as well as nationalism in our students and teachers. 2. During the period slogan writing and cartoon making on corruption free India, Elocution on ‘How can values education contribute in controlling corruption and Street play on ‘How does corruption tarnish the image of country in the global perspective. 3. Essay writing competition was conducted on the theme Role of IT in making India corruption free. 4. Run for unity was conducted on school level. We are really proud by observing Vigilance Awareness Week in school.